Launch of a Pegasus XL rocket. Credit: NASA. Wanna see a unique rocket launch? We’ve got one coming right up later today, when NASA’s Cyclone Global Navigation Satellite System (CYGNSS) takes to the skies. Breaking News: Word is that the Falcon-9 launch has now been pushed back to Monday, January 6th… stay tuned for updates! Expedition 37/38 crew ready for launch! The human population in space is about to increase by three this week with the launch of a Soyuz-FG rocket from the Baikonur Cosmodrome Wednesday night at 20:58 Universal Time/4:58PM Eastern Time. 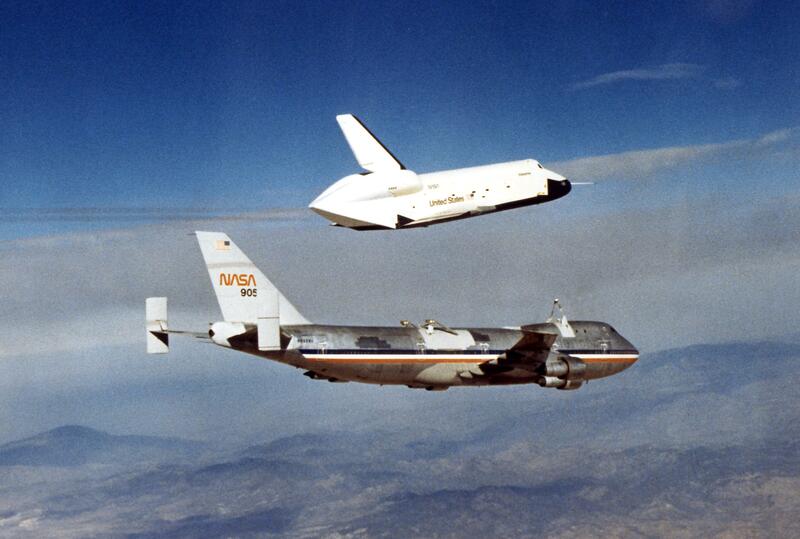 Enterprise in free flight for the first time. Astro-Event: A possible Draconid Outburst? Path of the Earth through the Giacobinid streams. (Graphic by Author). 21.09.11: Stalking the Re-Entry of UARS. UARS…Have you seen me in orbit? (Credit: NASA/GSFC). A unique re-entry event is about to occur this week, one that, if you’re lucky, you may need only your eyes to witness. UARS, the Upper Atmosphere Research Satellite has been on the shortlist for imminent re-entry over the next few days. Launched in 1991 from the payload bay of the Space Shuttle Discovery, UARS is a 6 ½ ton observatory built to study the Earth’s atmosphere, particularly the ozone layer. The satellite was decommissioned in 2005, and has since spent its maneuvering fuel. A debris avoidance maneuver for the International Space Station was conducted in 2010, and CALsky has pegged re-entry to occur on or around 02:30 UTC on September 24th. This will be the biggest object to re-enter since Mir and the largest uncontrolled re-entry since Skylab in the 1970’s, although we haven’t seen the attending hysteria connected with UARS that Skylab sparked. Are we a better informed, more intelligent public than we were in the days of Charlie’s Angels and the Love Boat, or are we simply more absorbed by the mis-adventures of Charlie Sheen and Lady Gaga? Whatever the case, our unofficial estimate is that there is about a 1-in-180 (24 hours x 60 minutes/about 2 passes a day of 4 minutes each) chance that UARS will re-enter over your horizon if you live between latitude 57 degrees north and south of the equator, which covers a good swath of the human species…follow @Astroguyz on Twitter for all the action-packed updates and keep watching the skies! No Nukes?-What the Plutonium Stoppage Means to the Space Program. MMMmmmm….Plutonium cake… (Credit: Department of Energy). When leaving our fair planet, mass is everything. Space being a harsh place, you must bring nearly everything you need, including fuel, with you. And yes, more fuel means more mass, means more fuel, means… well, you get the idea. One way around this is to use available solar energy for power generation, but this only works well in the inner solar system. Take a look at the solar panels on the Juno spacecraft bound for Jupiter next month… those things have to be huge in order to take advantage of the relatively feeble solar wattage available to it… this is all because of our friend the inverse square law which governs all things electromagnetic, light included. To operate in the environs of deep space, you need a dependable power source. To compound problems, any prospective surface operations on the Moon or Mars must be able to utilize energy for long periods of sun-less operation; a lunar outpost would face nights that are about two Earth weeks long, for example. To this end, NASA has historically used Radioisotope Thermal Generators (RTGs) as an electric “power plant” for long term space missions. These provide a lightweight, long-term source of fuel, generating from 20-300 watts of electricity. Most are about the size of a small person, and the first prototypes flew on the Transit-4A & 5BN1/2 spacecraft in the early 60’s. The Pioneer, Voyager, New Horizons, Galileo and Cassini spacecraft all sport Pu238 powered RTGs. The Viking 1 and 2 spacecraft also had RTGs, as did the long term Apollo Lunar Surface Experiments Package (ALSEP) experiments that Apollo astronauts placed on the Moon. An ambitious sample return mission to the planet Pluto was even proposed in 2003 that would have utilized a small nuclear engine. New Horizons in the laboratory with the RTG (on left) attached. (Credit: NASA). Yes, plutonium is nasty stuff. It is a strong alpha-emitter and a highly toxic metal. If inhaled, it exposes lung tissue to a very high local radiation dose with the attending risk of cancer. If ingested, some forms of plutonium accumulate in our bones where it can damage the body’s blood-forming mechanism and wreck havoc with DNA. NASA had historically pegged a chance of a launch failure of the New Horizons spacecraft at 350-to-1 against, which even then wouldn’t necessarily rupture the RTG and release the contained 11 kilograms of plutonium dioxide into the environment. Sampling conducted around the South Pacific resting place of the aforementioned Apollo 13 LM re-entry of the ascent stage of the Lunar Module, for example, suggests that the reentry of the RTG did NOT rupture the container, as no plutonium contamination has ever been found. The same went for another failure, that of the nuclear powered Nimbus B-1 weather satellite in 1968, in which case the RTG was recovered intact. Yes, the Soviets have had a few release failures historically (see below), but NASA knows its business and has a long standing track record of safely handling nuclear material. RTG’s are designed to withstand intact uncontrolled re-entry, spacecraft explosion, booster explosion, and a host of other high energy events without releasing the contents of the fuel package. Of course, all stats are highly speculative. The black swan events such as Three Mile Island, Chernobyl and Fukushima have served to demonize all things nuclear, much like the view that 19th century citizens had of electricity. Never mind that coal-fired plants put many times the equivalent of radioactive contamination into the atmosphere in the form of lead210, polonium214, thorium and radon gases, every day. Safety detectors at nuclear plants are often triggered during temperature inversions due to nearby coal plant emissions… radiation was part of our environment even before the Cold War and is here to stay. To quote Carl Sagan, “Space travel is one of the best uses of nuclear weapons that I can think of…” Whether it is as use as a thermal electric power plant, a nuclear propulsion engine, or even an Orion style bomb-propelled spacecraft, nuclear fission and the energy it produces provides us a way to get out into the solar system, now. Ideas such as fusion engines and Bussard ramjets are all well and good and should be researched, but for now are on the drawing board only. The joke is that contained fusion capability is always “20 years down the road” and may remain there for some time. Any science fiction “space ark’ will likely include an RTG or two…(Amazing Stories cover/In the Public Domain). One of the RTGs that flew on the Voyager spacecraft. (Credit: NASA). Are there alternatives in the nuclear area? Yes, but not without cost; for example, there are difficulties with the use of thorium isotopes. Relatively abundant in the Earth’s crust compared to uranium, the preferable thorium232 & thorium230 isotopes have a low abundance and a relatively low specific power in comparison to plutonium, again, making it a very poor heat source. In addition, thorium232 is bread to uranium233, which is nasty stuff and emits a very penetrating dose of gamma radiation as it decays further to thallium208. (Remember the Hulk?) Weaponized plutonium 239/240 also has too low a specific power, creating a huge mass penalty for outgoing spacecraft with its very short 30 year half-life. Strontium90 can be used as a RTG, but also at a great mass penalty. Same goes for any prospects of a pulsed fission reactor. In the 50’s through 70’s, NASA and the Department of Energy looked into the possibility of building a nuclear engine via Project Rover. This phases included Kiwi, Phoebus, and Pewee engines which were tested at the Nevada Test Site Area 25 desert complex facility… several extreme high altitude nuclear detonations where also conducted, most notably the Starfish Prime project in 1962. The Limited Test Ban Treaty of 1967 put the lid on further weapons testing in space, along with the prospects for a development of a nuclear propulsion engine. Small high power solid core fission reactors have been used in space as the heat source for turbo-electric high power applications (primarily Soviet radar-satellites for intelligence purposes). One accidently returned to Earth landing in Canada in the 1970’s causing much political uproar and very little environmental damage. Solid core propulsion reactors have been designed and tested in both the United States (NERVA) and Russia and have a solid theoretical and practical engineering foundation. None have been tested in space. This concept still stands as our best bet to get humans quickly to Mars. Nuclear-fueled & ready to roll; the Mars Curiosity Rover. (Credit: NASA JPL/CalTech). Currently, NASA faces a dilemma that will put a severe damper on outer solar system exploration in the coming decade. As mentioned, current plutonium reserves stand at about enough for the Mars Science Laboratory Curiosity, which will contain 4.8kilograms of plutonium dioxide, and one last large & and perhaps one small outer solar system mission. MSL utilizes a new generation MMRTG (the “MM” stands for Multi-Mission) designed by Boeing that will produce 125 watts for up to 14 years. But the production of new plutonium would be difficult. Restart of the plutonium supply-line would be a lengthy process, and take perhaps a decade. Other nuclear based alternatives do indeed exist, but not without a penalty either in low thermal activity, volatility, expense in production, or short half life. The implications of this factor may be grim for both manned and unmanned space travel to the outer solar system. Juxtaposed against at what the recent 2011 Decadal Survey for Planetary Exploration proposes, we’ll be lucky to see many of those ambitious “Battlestar Galactica” –style outer solar system missions come to pass. A mission like Juno headed to the environs around Jupiter gets around this somewhat by utilizing huge solar panels; Juno is scheduled to leave the pad at Cape Canaveral next month on August 5th and this will mark the first non-nuclear powered mission to the outer solar system. This will occur, however, at a huge cost; Juno must drag its panels along for the ride and will only operate in a wide 11-day Jovian orbit. This is necessary to keep Juno exposed to the Sun and will preclude exploration of the Jovian moons during its projected 32-orbit life span. The three solar arrays on Juno also equal an area of 650 sq ft, a large target for any debris in the Jovian system that makes engineers cringe. Solar cells are also sensitive to high radiation fields such as those encountered in Jupiter space. This is one of the factors behind Juno’s short mission life. Landers, blimps and submersibles on Europa, Titan, and Enceladus will all operate well out of the Sun’s domain and will need said nuclear power plants to get the job done… contrast this with the European Space Agency’s Huygens probe, which landed on Titan after being released from NASA’s Cassini spacecraft in 2004, which operated for scant hours on battery power before succumbing to the -179.5 C° temps that represent a nice balmy day on the Saturnian moon. One of the “other” uses for plutonium; Fat Man on Tinian. (Credit: US Govt image in the Public Domain). Part of what has always complicated matters is what is known as the Outer Space Treaty, or in its long-form, The Treaty on Principles Governing Activities of States in the Exploration and the Use of Space. Signed and ratified by the U.S., U.K. and the Soviet Union on January 1967, this treaty seeks to curb the militarization of space and specifically the use of space-based nuclear weapons as well as nuclear detonations in space. This has formed the basis of a broad amalgam of what been termed over the years as “Space Law” which covers such things as the international use of space, salvage rights and claims, and the non-recognition of any territorial claims on a celestial body. And while “Space Court” hasn’t become filler for afternoon or late-night cable TV, the Treaty did largely keep nuclear weapons out of space during the Cold War. Some of the ideas for an “EMP shield” over the US from the 50’s are slightly frightening to read about today, as we would be now reaping the environmental consequences. While said treaties never specifically limited the use of fissile material for deep space exploration, the very concept and stigma of “Nukes in Space” made it suffer by extension. Whenever a launch with an RTG occurs, a small band of protesters gather outside the gates and grab the media spotlight until the payload has cleared Earth orbit. Modern day fears of all things nuclear can be likened to the 19th century suspicion of electricity, which to date has taken far more victims than the peaceful use of radioactive isotopes in space. 3. Exploit other RTG sources at penalty. As mentioned previous, other nuclear sources in the form of Plutonium, Thorium, and Curium isotopes do exist and could be conceivably incorporated into RTGs; all, however, have problems. Some have unfavorable half-lives; others release too little energy or hazardous penetrating gamma-rays. Plutonium238 has high energy output throughout an appreciable life span, and its alpha particle emissions can be easily contained. MER’s curium-containing spectrometer. (Credit: NASA/JPL). 1. Push to restart plutonium production. Again, it is not that likely or even feasible that this will come to pass in today’s financially strapped post-Cold War environment. Other countries, such as India and China are looking to “go nuclear” to break their dependence on oil, but it would take some time for any trickle-down plutonium to reach the launch pad. Also, power reactors are not good producers of Pu238. The dedicated production of Pu238 requires either high neutron flux reactors or specialized “fast” reactors specifically designed for the production of trans-uranium isotopes. Going along with such specialized reactors are adequate safe facilities for the separation, concentration, and preparation of the final product. Since the end of the Cold War, the United States and Russia have closed and decommissioned the vast majority of their plutonium production facilities and reactors. The reconstitution of these cold war process plants is as of this writing beyond reasonable consideration. The huge plants at Hanford Washington and Savanna River South Carolina made sense during the Cold War, where Pu238 was a minor byproduct in the production of many tons of weapons grade plutonium. Practically, specialized research reactors at Oak Ridge Tennesse and Idaho National Laboratory can breed Pu238 and special separation and processing facilities there could produce gram per cycle quantities. However about 5kg/yr would be required to meet anticipated needs requiring a retool of currently available reactors and processing labs. Such a mission deviates critical research facilities from their primary missions that are themselves vital to understanding materials for spacecraft. Construction of new reactors and facilities for the production and processing of fissile materials is also fraught with significant funding, environmental, treaty, and local / national opposition hurdles. This can lead to very significant increases in cost over initial estimates and multi-decade delays prior to construction or production. Based on the realities of nuclear materials production the levels of funding for Pu238 production restart are frighteningly small. NASA must rely on the DOE for the infrastructure and knowledge necessary and solutions to the problem must fit the realities within both agencies. And that’s the grim reality of a brave new plutonium-free world that faces NASA; perhaps the solution will come as a combination of some or all of the above. The next decade will be fraught with crisis and opportunity… plutonium gives us a kind of Promethean bargain with its use; we can either build weapons and kill ourselves with it, or we can inherit the stars. 26.07.11: Naming P4; A Humble Proposal. 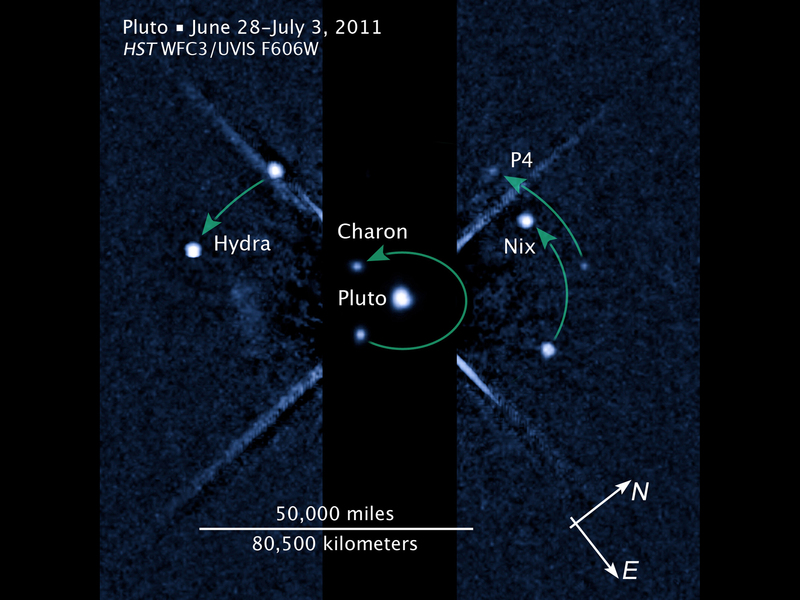 The many worlds of Pluto! (Credit: NASA/HST/SETI Institute). Astro-Event: Aphelion, an Occultation, a Launch and a Close Double. Sunday night’s occultation path across the US…(Credit: NASA/IOTA). AstroEvent: A Solstice, an Occultation and More! Summer Noctilucents over Astroguyz HQ… (Photo by Author). A Look at the Earth’s Interior. Eruption! Our active planet as seen from the Aqua satellite… (Credit: NASA). The Earth is the only terrestrial planet that we have the availability to reach out and examine up close. By use of painstaking scientific processes, we can monitor the inner workings of our world and create a model of its interior structure that presents a high degree of accuracy with what is observed. Still; while we live on its surface, we have never penetrated the shell of even its outer crust or sampled its deep interior… just how do we know what’s within? To map the Earth’s interior perhaps no tool is more essential than the seismograph. Also sometimes referred to as the seismometer, this device is essential for recording and monitoring seismic waves in the Earth’s crust and their passage through the interior. This device usually consists of an internal inertial mass that is deflected relative to an external frame, usually anchored to the surrounding bedrock. As the device is shaken, the mass is moved as waves pass through it, deflecting a needle against a scrolling spool of paper marking the passage of time. Early detectors were constructed during the Chinese Han Dynasty. Modern detectors may be on the classic needle deflection type or digital and utilize the precise measurement of laser beams or a mass magnetically suspended generating a negative feedback loop. Key waves detected are P, or primary waves, S, or secondary waves, and surface seismic waves. P waves are the initial “push-pull” waves of an earthquake. These are the fastest waves, and thus the first recorded during a seismic event. An elastic wave, P waves can travel through any medium, be it solid, liquid or gaseous. These waves are compressional and can also vary with the subsurface depth of the earthquake. Next waves to arrive are the S, or shear waves. Also known as transverse waves, these are slower moving and can only travel through solid material. Finally, the surface waves are the last to arrive at a given detector, as they are slower moving and generally cause the most damage. If these waves can be recorded by three separate detectors spaced out on the Earth’s surface, a precise epicenter can be pinpointed. Also, the fact that an Earthquake shadow zone is generated where only P waves are seen is prime and well documented evidence that the Earth’s outer core is not solid, but molten. Indeed, the magnetic shear or torsion generated by the interplay of Earth’s iron-nickel solid core, and liquid molten outer core, is further evidenced by our relatively strong magnetic field. In comparison to the Moon and other terrestrial or rocky planets, the interior of the Earth is a dynamic place, and seismology helps us understand this differentiated structure. Elements of seismograph construction may include a digital strong-motion accelerograph or several inter-connected seismometers working to create one coherent output. A classic earthquake will first register on a seismogram as a series of short spikes marking the initial P-waves. Minutes later, the first S-waves will arrive spanning a slightly longer period of time. Finally, the largest and most damaging surface waves arrive. As seen on a seismograph, the timing and spacing recorded at an individual station may vary depending on the depth and distance of the earthquake epicenter. The science of seismology is crucial to understanding the interior structure of the Earth as well as predicting where damaging earthquakes or tsunamis are likely occur. This study is vital to the whole Earth model because although we cannot directly sample interior layers of the Earth, we can model them by examining the speed and types of waves that transverse the crust, silica rich mantle, and inner and outer cores. The outer surface of the Earth is composed of tectonic plates that either converge, or subduct one under another, diverge or separate, or strike slip or grind past one another. This type of surface material recycling drives what’s known as the rock cycle. The outer-most rigid crust is known as the lithosphere, which is comprised of the crust and a layer of brittle and solid rock about 100 km thick. This crust is thickest on the continents, and thinnest underneath the oceans. Of special interest is a separation known as the Mohorovi?i? Discontinuity, first discovered in 1909. This boundary between the crust and the Earth’s mantle was deduced by studying the refraction pattern of earthquakes by shallow p-waves. Farther down, the lithosphere rides along top of the flexible and molten asthenosphere. This layer extends down to a depth of about 400 miles and is mechanically detached from the deep lower mantle. Again, only P-waves can travel through molten regions of the inner Earth; S-waves cannot. This key fact is prime evidence that the outer core of the Earth is fluid, or molten. Likewise, the refraction and reflection of seismic waves can also provide us with a “look” inside the Earth to probe its interior. But beyond the probing of Earth’s interior, the study of seismology is crucial to other applications, both scientific and economic. The study and conduction of seismic waves can be applied to locating large fossil fuel deposits as well as prime aquifers or areas of potential sink hole activity. Again, this utilizes our understanding of the transmission, reflection, and refraction of P- and S- waves through solid versus liquid and gaseous material. Seismology is also used to detect nuclear weapons testing, and to assure compliance with test ban treaties. The liquid outer core is further evidenced by the creation of Earth’s magnetic field. When we look at smaller, cooler bodies such as the Moon and Mars, little evidence for a magnetic field is seen; in fact, the low density of the Moon versus its size is prime evidence that it was once part of the Earth’s crust and mantle ejected by a massive impact. Igneous basaltic rocks brought back from the Moon by Apollo astronauts support this theory. Finally, seismology demonstrates evidence for plate tectonics by showing observational proof that the plates of the lithosphere are active and in motion. Plates snapping back into place or grinding past each other all generate massive amounts of seismic waves in what we know as earthquakes. Over time, these cause the raising of great mountain ranges such as the Himalayas or massive earthquakes such as were recently witnessed in Haiti, Chile and Japan. In conclusion, seismology and the study of seismic waves are key examples of how we can study something in science without directly examining it. Beyond just scientific interest, this has given us such benefits as the Pacific Tsunami Warning Center that has saved countless lives. As we move out and study other planets in our solar system, knowledge of the interior structure of the Earth will give us some insight into comparative planetary science and just how common or rare a dynamic place like Earth truly is. MPCV in Martian orbit. (Artist’s concept/NASA).